Prevention. Parenting Classes to Immigrant Families. Post 67 Part 1. When we think of the many immigrant Latino, or other immigrant parents, who have experienced a prolonged separation from their youngsters and how many of them may be imbedded in the many groups that are taking parenting classes either on their own, or as a recommendation from a program, or from the child’s school, then it becomes so important to add to the regular curriculum of the parenting classes, segments that properly address the experience of reunification and its issues, as presented all through the posts in this site and eventually in workshops enclosed in the future book based on them. These parents desperately need for the presenters and experts who are imparting this training, to acknowledge and validate for them, how difficult it becomes to handle discipline and set limits when trust and bonding between parent and child is so fragile because of a long separation. These issues, which are so different from the family that has never separated, need to be incorporated. In this way we secure these parenting skills training to be effective and for the parent not to fall deeper into a road of despair, failure and discouragement. These parents do not know these children well enough in most instances and fears of rejection, guilt and even lack of experience dealing with an older child or a teenager, make the parenting experience so much more confusing. These feelings need to be acknowledged compassionately and truly accepted as normal by trainers and the parents need to know that they are not the only ones feeling them, but it happens so commonly under the circumstances of prolongued separation. The parenting trainers need then to be thoroughly familiar with the issues of the reunited immigrant family who is together after this long separation, to be able to guide these parents and respectfully understand their feelings. It becomes as challenging, if not more, than parenting for example, in the blended family, where there is divorce and remarriage. Perhaps we need to stop teaching parenting classes as if there is only one type of family that requires one formula, instead of the myriads of different circumstances and compassionately acknowledge the differences and suggest adjustments and understanding for them, so that some families feel more seen. Theater/dance, poetry/song writing and visual arts are all wonderful means that can be utilized with the immigrant youngsters by creative professionals in the school system, or in programs in the community, to help them open avenues of expression to their concerns and painful experiences, as well as pride in their culture. Those experiences could be their losses of loved ones left behind: Psychologist Consoli et als. from the National Latina/o Psychological Association suggest for example a Memorial Wall of the family back home in the form of drawings, or essays, to exhibit in the classrooms, or the bulletin boards in hallways, to communicate the adults’ compassion for their losses, or, for their struggles adapting to a new culture and a new family, or the pains experienced on their road here. I know from my own experience in my school system, how teachers encouraged such stories, collected them and even made them into nice small books, in that way bearing witness to the feelings and giving them a place of importance. In addition, the stories became a tremendous education about the kids for the teachers themselves. The same group of psychologists suggests tying these stories to narrative therapy intervention to help children deal with traumatic experiences. As English is very limited for newcomers, perhaps the youngsters can record the stories in their native language with the help of a bilingual adult and then they can be translated, and “published” with the enclosure of the original, thus the result would be a bilingual product. Prevention. Post 65 Bridges Across The Distance. In the same spirit of prevention, there is a need to ask from the health authorities of the countries where the youth are coming from, so that they too can take a renewed interest in helping these families do it in a way that diminishes the impact of the separations. For example, aiding in the way the separation is explained to the child by highlighting the losses and sacrifices of the parent and how hard it was for that parent to leave the child. And in focusing on the youngster, stressing the need for him or her to be allowed to express his/her feelings of loss to the new caregiver, while helping them in the best ways to receive that expression so that the child finds comfort, such as offering a hug or sharing in their sadness, all of this as only a natural outcome of the separation and something that will subside in intensity with time. This kind of information is urgently awaiting wider dissemination back at home. Every time I watch a segment in the news about the parents in this country, who joined the armed forces and were sent to the war front and how they are provided with the means to communicate to their children left back home, by reading children books to them via Skype for example, my heart wishes that opportunity was available also to the immigrant parents who left young children at home. Would it be possible for clinics, libraries, churches, or some benefactor to pay for internet time in the internet cafes, for the caregivers to bring the children to be face to face with the parent who is away and listen to a story, either read or oral, or play a simple game with a puppet, or sing some old children’ s songs with that parent? Or, perhaps in the local community center or school in the USA, someone could assist and guide the parent to video tape such an exchange and then send it via internet? All of those extra efforts and care would make an important difference for both the parent and the child in allowing the bonding to keep alive, or at least not totally extinguished. Perhaps it would take a lot of hand holding and encouragement to engage the parents in a project like that, as it would be awakening painful emotions of loss. Perhaps they would benefit to hear that tears are OK, as in that way the child knows it is because they miss them and love them. And, of course the parents’ time is so taxed already; however, I can imagine that with the right encouragement it would become a great experience for the parent and the child. In fact, some immigrant parents who are more technologically savvy are already taking advantage of some of these tools on their own. However, it is still probably a minority. Prevention. Post 64. Fun over the Border. What a wonderful idea: fun over the border!!! Americans and Mexicans playing volleyball over the border fence. In the spirit of prevention, some very innovative and interesting pilot programs have been tried showing promising measures of success with at-risk youngsters from high-schools with a large population of Latino students. One such program was undertaken by Dr. Karen Bluth and her team of researchers from the University of North Carolina, School of Medicine in Chapel Hill. They designed a randomized controlled trial to measure the effects of mindfulness stress reduction training on a school-based program targeting at- risk youth. In it, in an alternative school for students failing regular high-school, 27 ethnically diverse adolescents, the majority, 47% of them, Hispanic, were assigned to either a mindfulness training program called Learning to BREATHE, or a substance abuse educational class. The classes met once a week for 50 minutes over the course of an entire semester. The youngsters in the mindfulness class showed a greater reduction of depression symptoms and lower levels of stress than those in the control class. Many people are not familiar with the concept of mindfulness, though it is a practice increasingly used and researched in fields like medicine and health, education and psychotherapy to name a few, mainly for stress reduction, but also to increase focusing and processing of information, emotional regulation through changing impulsive responses into thoughtful ones and for increased empathy and self-awareness . It was introduced in the 1970’s by Jon Kabat-Zinn, a professor at the school of Medicine in the University of Massachusetts. In his words: “Mindfulness means to pay attention to the present moment, with intention, in a non-judgmental way. It is a practice of awareness and observation.” It can be taught at all age levels starting with simple to follow exercises. Locally, Minds, www.mindsincorporated.org, a non-profit organization that works with schools in the Washington DC, Northern Virginia and Maryland area provides training in mindfulness to students of all levels: Kindergarten to High School, with mindfulness based skills that build emotional resilience, empathy and compassion, increase concentration and awareness of self and creativity, as well as offering workshops and classes for teachers, parents and staff, through training at the school site. Their curriculum is based on evidence based mindfulness meditation education, yoga, cognitive neuroscience, social emotional learning, mental health and psychology. An important word of caution, however. Whenever a youngster might be someone who was exposed to trauma, (as some immigrant children have), great care has to be taken to allow for them to have control over the practice or intervention used, by being able to stop if uncomfortable, so as to avoid them being overwhelmed by negative feelings and memories in the course of the exercise. Mindfulness exercises may put them at greater risk of being flooded by these negative images and feelings and consequently re-traumatized. The same is true for a trauma victim of any age, as recommended by specialists involved in the treatment of trauma. According to them, the most important thing is to provide a feeling of safety first. Thus, to start any training by teaching skills that provide a quick return to safety when faced with uncomfortable emotions and memories. These may involve breathing techniques,body posturing and redirecting attention to the present. Turning now our focus to the youngsters, who love their MP3s and cellular phones and learn so easily to use them, it would be great to explore having apps, or presentations for them to download and listen, available in the clinic of their school, or in the media center, or DVDs that could be watched in the computers at their school and could even be integrated in some project of the ESL class. Thus, using media to help them get a better understanding, as well as feel understood and validated with their struggles to adapt to the new family. These could incorporate suggestions on how to go about helping themselves when they feel isolated, angry or sad. Sensitizing them also to the common feelings the parents have with them in this situation, as they too feel afraid of rejection and are suffering also as their dreams of a perfect reunion are not materialized and, finally, suggesting ways to open bridges in communication with them and improved day to day interaction. Media tools could also make available to them adapted relaxation and guided meditation materials in their language, which could teach them valuable skills to handle negative emotions, beyond learning them in workshops or group counseling as suggested earlier. Prevention. Family Activities. Post 61. The reunited immigrant family trying to reestablish the lost bond is in great need of positive and relaxing recreational activities that they can do as a unit, where some guidance and structure may help them overcome any uneasy feelings. Like it has been mentioned before, some hard working immigrant parents may not have much experience with recreation in their lives, or models about doing it just for the fun of it. Their wholes lives and that of their families might have been one of just hard work, therefore they may need guidance and encouragement regarding the kinds of things that can be done in our cities for recreation with the kids; and that might be totally new to them and perhaps a bit scary. Field trips including parents, or special nights of family games are some possibilities that come to mind as possibly helpful in creating these kinds of positive experiences. An idea that might be helpful in motivating their participation and in them finding the time and energy in their stressful everyday lives may be one of creating new and joyful family memories for the child and themselves that will help in bringing them closer. And who knows, maybe they can try something fun and totally new…. The wonderful news is that dissemination of information is beginning to happen in different parts of the country, as for example, a pamphlet that was developed as part of a doctoral dissertation, giving service providers advice to help the mothers on what to do during the separation and during the reunification with the child. (Guerrero, 2005), and, as Dr. Falicov suggests (Falicov (2014), this same pamphlet, or a modified version could be made available directly to the mothers in clinics around the country. It is also evident in the reports of journalists telling the stories of the unaccompanied minors. In these, social workers from the Department of Human Services are portrayed as preparing a parent for the upcoming reunification with their child, who is being sent home after being in their care, by suggesting positive activities to try with the child. One could be for example a reunification party to celebrate the event, an idea suggested again by Dr. Falicov, (Falicov, 2014), and mentioned in one such story, provided the adults involved secure first the permission from the child to avoid causing any additional stress or discomfort. This provision is my suggestion, as I could envision a child or adolescent who is still grieving the separation from his/her caretakers and/or healing from the traumatic experience of crossing the border and who might not feel quite ready for a celebration. The most important thing to do with such a child is to deeply respect and provide a space for the child to express those feelings to the adults welcoming them in a caring unpressured fashion that fosters a sense of security and acceptance. Simultaneously, the parents need support and guidance in putting aside their fears of loosing the love of this child, but rather opening their hearts with patience and willingness to rebuild the relationship slowly, as it has been emphasized and detailed earlier. Efforts at dissemination are present also in graduate students trying to develop psychoeducational materials as part of their course work and contacting this author/blogger for information. Allelluia! 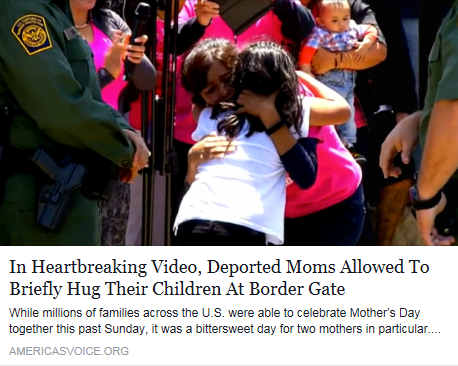 Last Sunday, it was not a happy mother’s day for some mothers. I imagine for many reasons, like loss, war, poverty, violence, etc. However, this is one that is so very sad as well: deportation. Another very important instrument in disseminating information could be culturally relevant programs addressing the issue of family separation and reunification to be aired periodically in Spanish TV channels. In fact this has been done in the past in the Greater Washington DC area, as mentioned earlier. Articles in magazines and newspapers, which are popular with the Latino immigrants and other recent immigrant groups, could also help spread information. All of these materials would help not only present populations of youngsters coming to join their parents after a prolonged separation, but also they would help those youngsters who are now adults, moreover, at present, parents themselves. 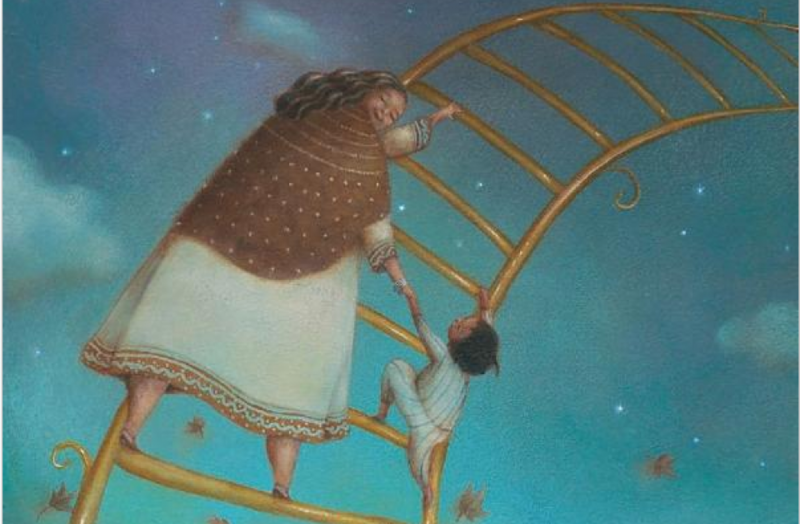 This population has shared with this author, when present now as adults, in workshops on immigrant family reunification, about their ongoing struggles with reconnecting with their parents because they too were separated for a long time. The emotional aftershocks of this separation in their lives and in their relationship with their parents remained still in their lives years after, as some of them stated. These issues connected with separation and trust could possibly affect their parenting and also their couples’ relationship, in perhaps unseen ways, as any unresolved issues affecting attachment to primary figures do for all of us. In fact, the hope of this author in writing this book is to inspire the creation of interventions and materials that can help parents and their children living at present, or having gone in their past through the reunification process and who perhaps still struggle with recovering from this emotional process of building their new relationship with parents. Materials such as pamphlets, short comic books depicting the family communicating in a healing and significant way, which could be waiting in strategic places like medical offices and community clinics where immigrants routinely go.